In 2016 the Third International Consensus Definitions for Sepsis and Septic Shock (Sepsis-3), redefined sepsis as life-threatening organ dysfunction caused by a dysregulated host response to infection. This group postulated that sepsis can be identified through an increase in Sequential Organ Failure Assessment (SOFA) score of at least 2 points. The quick SOFA (qSOFA) score is a simplified tool that includes respiratory rate >21 breaths/min, altered mental status, or systolic arterial blood pressure <100 mm Hg. Retrospectively derived, it has been considered a possible replacement for the Systemic Inflammatory Response Syndrome (SIRS) criteria and as a surrogate for the SOFA score in identifying sepsis. To date, there have not been any prospective studies evaluating the performance of qSOFA in comparison to either SOFA or SIRS in the Emergency Department (ED). Does the qSOFA score more accurately predict in-hospital mortality than the SIRS criteria or severe sepsis criteria among ED patients with suspected infection? All consecutive adult patients with clinical suspicion for infection who presented to one of 30 EDs in Europe over a four week period. Data was prospectively collected to assess the qSOFA and SIRS scores and severe sepsis criteria (SIRS + lactate) in the ED based on the patients worst level. Primary: In-hospital mortality within 28 days of initial encounter. Secondary: Admission to ICU, length of stay in ICU >72 hours, and composite of death or ICU stay of more than 72 hours. International, multicenter prospective cohort study in which patients deemed to have an infection by the treating emergency physician were followed throughout their hospital course. Two experts determined in each case if the initial ED presentation was due to an infection. Patients who were deemed to not have an infection by two experts reviewing each case, as well as patients who refused to participate, pregnant women, prisoners, low acuity patients, patients in custody. In this prospective validation study, qSOFA performed better than both SIRS and severe sepsis in predicting in-hospital mortality from sepsis. However, with a sensitivity of just 70%, use of qSOFA alone would lead to an unacceptable miss rate. These results underscore the fact that sepsis is a complicated process and identification is unlikely to be simplified down to 3-4 criteria. The use of qSOFA alone should not replace the use of good clinical judgment for determining patients with sepsis in the ED. However, qSOFA > 2 is an excellent marker of severity of illness and should be used as such. 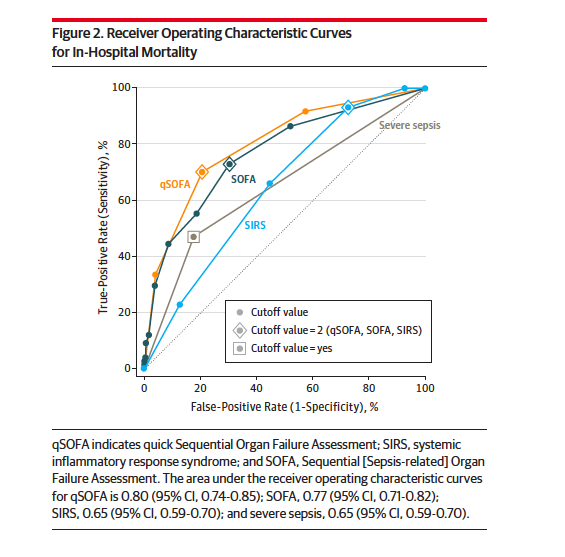 Patients who present to the ED with an infection and have 2 or more qSOFA criteria while in the ED have a high inpatient mortality rate, yet qSOFA alone cannot be used as a rule out or used as a screening tool for sepsis due to the poor sensitivity.